Premier Jay Weatherill’s powerful political skills continue to divert blame for the state’s economic malaise to outside forces when the real problem is much closer to home, writes economics commentator Richard Blandy. We lucky people who live in South Australia know this is a wonderful place to live. This is particularly so, these days, if you are sufficiently old that you are no longer looking for a paid job. We are fabulously endowed, in global terms, with natural resources, human skills, and stable, democratic, political institutions. Given these advantages though, why are our economy and employment growing at only half the rate of Australia’s as a whole? How do we explain the contradiction between South Australia being a wonderful place, full of decent, capable, hard-working people, yet trailing the Australian economy as a whole by a wide margin? Could the State Government’s economic strategy – “Strong Government” – be responsible? After all, “Strong Government” gave us Gillman, the abandoned international nuclear waste dump, Transforming Health, the most expensive new hospital and the most expensive electricity in the world, as well as the most expensive water in Australia, the Families SA and Oakden scandals, heavily government-subsidised extra private-sector jobs, and a number of government-subsidised, new businesses. Sanjeev Gupta’s Liberty House, part of the London-based GFG Alliance, decided all by itself that buying Whyalla’s Arrium steelworks from its receivers, Korda Mentha, at a “non-bargain price” was still a good investment. Gupta is quoted by the ABC as saying that “his company’s model wasn’t to seek large sums of money from governments”. The multi-million-dollar subsidy for the winning tenderer expended by the South Australian Government was needless, notwithstanding Premier Jay Weatherill’s political spin on the welcome outcome that it was “a dramatic victory for us here in SA”. The broader spin is this: it’s SA against the world, battling alongside friends like Sanjeev Gupta, with dark outside forces meaning to disadvantage us. Friends of SA are businesses that are capable of recognising our virtues and deserving of our thanks and (governmental) financial support in return. The most recent and most highly visible of these friends is, of course, Elon Musk. Last year, Forbes magazine ranked Musk twenty-first in its list of the world’s most powerful people. He is said to be the eightieth wealthiest person in the world, with an estimated net worth of US$15 billion. Among other notable achievements, he was a co-founder of PayPal and Space X, and is CEO of Tesla. The truth is that it is South Australia’s politicians – particularly its Labor politicians, who have been in power for most of the last quarter of a century – who should be held to account. Musk will build a 100MW battery near Jamestown, paid for by South Australia’s taxpayers. It will easily be the biggest capacity battery ever constructed, and it is hoped it will join the other 150 BIG objects in Australia as a tourist attraction. It will be charged from a nearby windfarm. Its main function will be to reduce peak wholesale electricity price spikes, which add significantly to average wholesale prices when they occur. The battery is incapable of solving a statewide blackout and is not intended for this purpose. It would be able to power the state grid for only a few minutes. However, what Musk brings Premier Weatherill politically is incalculable. Here is a genuine world figure recognising and paying tribute to South Australia! In video images of the joint announcement by Musk and Weatherill, the glee on the Premier’s face is unalloyed. He knew how the footage would play in the living rooms of South Australia that evening. With amazing good fortune for Weatherill that Musk will return to South Australian in September, to participate in the 68th International Astronautical Congress. He has said he will use the event to provide an update on his long-term plan for colonising Mars using his company, Space X. What he says will undoubtedly make world news and provide further recognition for South Australia, yielding further political gain for the Premier. 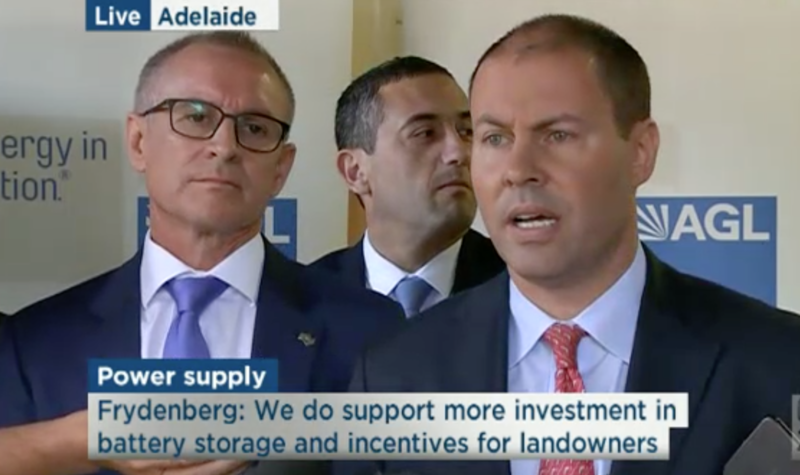 We already had a taste of Weatherill’s political strategy for re-election in his confrontation with federal Energy Minister Josh Frydenberg on the cause of SA’s high electricity prices (broadcast live to air earlier this year). It is the Commonwealth’s fault, said the Premier. They are picking on South Australia (yet again). We will have to go it alone with the support of our friends, wherever we can find them. This political strategy has been confirmed not only by the State Government’s complaint it has been short-changed by the Federal Government in its financial support, but by its rebranding of the Big Banks (the targets of its bank levy) as the “East Coast Banks”. The message is clear: they are no friends of South Australia and are therefore a legitimate target. Jay Weatherill, Tom Koutsantonis and Josh Frydenberg in their on-air confrontation. So this is the explanation being offered by the South Australian Government to explain the contradiction between our strengths as a state and our lagging economic performance: there are powerful outside forces that are hostile to us. This political ploy has worked throughout history, often with the added identification of “undesirable” local elements that are white-anting the noble cause. In 25 years, South Australia’s politicians have not rectified our fundamental, structural, economic weaknesses. While Premier Weatherill has said that the world does not owe us a living, his government has not taken effective steps to ensure that we are as capable as any group of Australians of earning our own way. The reason for this is political. Our state politicians do not believe that voters will support real solutions to our economic difficulties, which requires our economy to become much more citizen- and business-driven and much less reliant on government. The transition is likely to be difficult and last longer than one term of parliament. As I have written in these pages before, Adelaide has become a company town where the company is the South Australian Government. We will continue our economic decline relative to the rest of the country unless the economic dominance of the State Government ends. But is this politically possible? That is the real conundrum defining South Australia’s economic future.